Gummi bears–and not those squishy, pretending to have something to do with real fruit flavor junk you see at the grocery store, but the original ones. There’s a candy store in Hampton called Sanborn’s where I get mine. I don’t really have one. Maybe Ariel from the Little Mermaid–although I totally dig Ursula, too. You have to ask? Breathing underwater, of course. C.H.) Seaborn is about the loss of control, the loss of freedom in two different forms and how it affects each character, how each of their stories flow together. Corina Lairsey has lost all physical control to someone else, and she goes from misery, fear, hopelessness to having to deal with her captor–deal with evil–in order to get her freedom back. Kassandra has extraordinary power, commands tides, does all this wonderful and scary stuff with the oceans, and at the same time, cannot ever be certain that any motive, direction, decision is really hers. She shares her soul with other powers, she’s been set up by others to be something she doesn’t want to be, she’s lost the ability to control her future. More concretely, Seaborn’s about people who have–long ago–been cursed to live off the ocean’s power. They don’t have to worry about pressure, drowning, temperature extremes. They’ve built cities, fought wars, lived down there for thousands of years. They look, for the most part, just like us on the surface. Kassandra’s grown up as far from the ocean as her grandfather, the king, could arrange–Nebraska. Now she’s ready to return, declaring war on her grandfather, ready to take back what is hers. Corina Lairsey isn’t from the sea–she’s from California, lives south of San Jose, but she’s taken by someone–something–that needs a body in a hurry, and Corina’s handy. Q.) Do you consider Seaborn fantasy, urban fantasy or something else? Q.) Why under the sea? C.H.) I have been fascinated with the oceans, life the in oceans, the abyss, weather, waves, tides, everything saltwater since I was nine–that’s when I decided I wanted to be a marine biologist when I grew up. (It didn’t work out. I’m a software engineer, but I’ve never lost my interest with the sea). Q.) What kind of research did you have to do to make characters who can live underwater feel real? C.H.) A lot, mostly spread out over years. I don’t really go into the source or explanation of the powers in the story, except where it’s relevant, but I did spend considerable time researching what’s remotely possible underwater and how it could be accomplished. I began writing about Kassandra in 2003, trying to fit the constraints (people who live in the ocean but don’t look much different from us) with reality–and I think fantasy writers have to in order to make the setting, motives believable. I also think that worldbuilding isn’t for the reader, it’s not for the author to dump onto the page. The real purpose of worldbuilding–all those exercises an author does to construct a believable world, the culture, politics, the way magic works–is to allow the author to write comfortably in that world. I’ve blogged about some of my research at SaltwaterWitch.com, including an essay on hearing underwater. Q.) Seaborn tells the story of two females, Kassandra and Corina Lairsey. To you, whose story is it? Or is it both of theirs? C.H.) It’s both, with Corina’s story starting and finishing with Seaborn, and Kassandra’s continuing into the sequel, Sea Throne (expect it sometime in 2009). I have also completed a “prequel” to Seaborn that goes back five years before the events of Seaborn. This one’s a YA, and is under consideration with another publisher. The whole story is Kassandra’s, this book–Seaborn, then next–Sea Throne, and a prequel that is currently under consideration. Q.) Your publisher Juno Books specializes in fantasy featuring strong female characters. Why did you choose to have female protagonists? What makes them strong? C.H.) I started writing about Kassandra in 2003, and I got into a groove with female protagonists–and it’s still going. For me, strength is about self-reliance and will and refusing to act against principles. I don’t dwell a lot on physical strength in my stories. My characters are as strong as they need to be, and I can’t think of a case where any challenge was won by muscular strength. I love internal struggles. Many of Kassandra’s battles are with herself or the others inside her. Corina’s storyline is very similar. Q.) How long have you been writing? Can you tell us anything about your road to publication. How long? Mistakes you realize now or tips for people starting out? C.H.) I’ve been writing fiction, poetry, songs, since I was a teenager. My mother was an actress, artist, wrote fiction and non-fiction, and I always knew I wanted to write as well. It took a long time, but it’s been somewhere in my mind–back and front–all along. I’ve done the most and learned the most in the last five years, writing continuously, short fiction (first story to get past an editor was Diminisher of Peace in 2005, appeared in The Harrow, and I think I made enough to buy lunch). Seaborn is my first sale of novel length fiction, a little over a year ago. I’ve completed two more novels since then, including Sea Throne, the sequel to Seaborn. Mistakes? Make them all is my advice, try everything, fail, get back to putting stuff on the page. I know I haven’t made every mistake, but I’ve done things like misspell editor names, magazine title names, asking editors, agents too soon if they’ve had time to read my story, sent out crap manuscripts–but I think there’s a lot to be learned from making them and learning. It’s also very likely that I’m a slow learner. As far as tips, there are things I didn’t realize a few years ago, like the importance of conventions, the social side of writing. If you’re not going to your local SF/F convention–or better the major ones, you should. Q.) Are you a plotter or pantser? Character driven or plot driven? Ever try to be the opposite? Do you have a set method you use when starting a book? C.H.) More panster than plotter. I just need to know where to go. Plotting too much takes the edge, the uncertainty, the fun out of the writing–so I don’t try to be the opposite. I usually begin with an idea and the characters flow out of that, not the other way around, unless you consider a character with a particular problem as the idea (I do). I’ve just finished my fourth novel (fourth worth publishing) and in every case I have started with an idea (explore revenge, different ways the loss of freedom can be played out). I’ll write three or four chapters, then I’ll write the ending–or something close to it. That’s my destination. I have a beginning and I know where to go. I can write a 130,000 words in that gap. C.H.) Two novel length projects. One is another Seaborn story, but set in the past. Another’s a YA fantasy with cooking and food magic. Q.) Who do you enjoy reading? If someone were to compare your books to anyone else’s what author would you most likely be compare to? Why? C.H.) I love Connie Willis, Neil Gaiman, Caitlin Kiernan, Lois Bujold, many more that, but I’d put these four up as major modern writer influences, and I’d love to be compared with any of them. Why? Widely different styles, settings, senses of humor, all coming from different directions, but they’re all storytellers. C.H.) Seaborn is available (end of July) anywhere you get books, at all the major chain stores (Barnes & Noble), smaller retailers like Pandemonium in Cambridge–or your local bookshop. You can get it online at all the usual places, Amazon.com, through Book Sense. 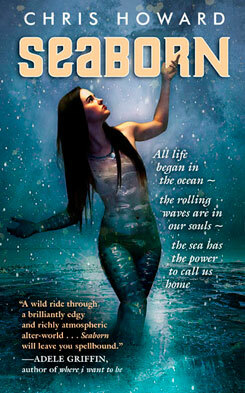 Find out more about Seaborn and sequels at www.SaltwaterWitch.com. I also blog on writing, art, everything else, at http://theophrast.us . I’m on Facebook, and I have pages, links, profiles all over.